The Hope Project Multiply Internship Program is for the missions-minded person typically aged 18-30. This low-cost internship program provides a great cross-cultural missions experience. You will be able to get your feet wet in missions by ministering alongside our staff serving those who live in extreme poverty. Interns learn how to effectively determine needs, build relationships and share the love of Christ. The Hope Project Multiply Internship Program (MIP) interns have the opportunity develop and use their individual talents and abilities while serving in one of the many Hope Programs in Matagalpa, Nicaragua. The living cost varies depending on length of internship. The cost Includes: Food, housing, utilities, and training. Airline tickets are not included and must be purchased by the intern. How do I apply for an internship with MIP? Thank you for your interest in serving on a summer internship. Once you've filled out the application. We will review your application. If you're interested in serving outside of summer, we also have other 1–11 month internships. •Application deadline for Summer 2019: May 31. •Application fee: $25. Once you complete your application, you will be presented with the opportunity to pay the application fee. How much will I need to raise to serve as an intern? The cost to participate is $600.00 per month. We will help you by setting up a recurring donation link for your account. What on-field expenses are typically included in an internship budget? Ministry-related housing, food, transportation, and training costs are included in your ministry budget. When do I have to have the funds raised? Once you are approved and invited to serve a budget will be provided. 100% of your budget support is required one month before you depart for the field. What if I don't raise 100% of the funds? If you are unable to raise 100% of the support in time for your set departure date, we will either revisit your departure date, or prayerfully decide the best next steps. Will I be paid? Internships in our summer program are volunteer, unpaid positions. You will need to raise support to cover your expenses. .
Where will I live? Housing may include sharing an apartment with other interns, living with missionary families. This is something determined individually once you are apporoved. Can I choose where I serve? We want to help you to develop and use your talents and abilities to glorify God. You will serve alongside the Hope Staff in our Hope Programs. During the Summer you will help facilitate mission teams, help plan and prepare for activities, serve in Sor Maria or 3M Hope Centers. 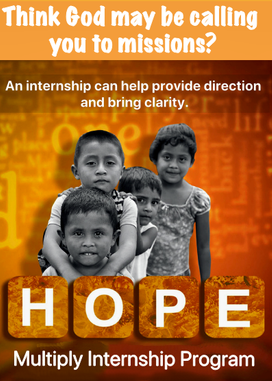 Age requirement: Generally, interns must be 18 or older to serve with Hope Multiply Internship Program as a volunteer intern. Language: We do not require language proficiency, but encourage participants to learn basic Spanish. Vaccination requirements: Required immunizations include a tetanus booster within the past 10 years and all routine immunizations (dT-diphtheria, tetanus; MMR-measles, mumps, rubella; and polio). Insurance Requirements: All volunteer (summer) internship participants are required to have a traditional medical insurance policy which will cover them for the entirety of their internship. If the insurance policy does not cover overseas travel, interns will need to purchase a supplemental medical insurance policy for their dates of service..